NEW ORLEANS (CNS) — For eight days at Loyola University New Orleans, three priests and five deacons absorbed the cool mathematics and internal symmetry of good preaching. Just as Moses descended from Mount Sinai with Ten Commandments chiseled on two stone tablets, the rules laid out by Father Roy Shelly and Deborah Wilhelm of the Diocese of Monterey, Calif., while not etched in permanent marker, are boundaries worthy of respect: six to eight minutes for a Sunday homily, three to five minutes for a weekday sermon. “The idea is not so much ‘brevity’ as it is not taking longer than you need,” said Wilhelm, a doctoral student with a focus on preaching at the Aquinas Institute of Theology. Improving the quality and spiritual depth of preaching has been a passion for Father Shelly, who is director of vocations and oversees homiletics training for the permanent diaconate in his diocese. If priests and deacons do not take seriously their vocational call and the preparation needed to preach the Gospel, Father Shelly said, the resulting communication will be flat and possibly even an obstacle to worship. Over the course of a week earlier this summer, three priests from the Archdiocese of New Orleans — Fathers Chris DeLerno, Kevin DeLerno and Martin Smullen — joined five deacons in preparing two homilies each, which were videotaped and then critiqued by the group. Spiritual preparation is critical, Father Shelly said, and the methodology employed involves “lectio divina” — reading, reflecting and praying over the Scripture passage. In training preachers, Father Shelly asks them to write down one sentence that encapsulates the homily they are about to give. Then members of the congregation are asked to write down in one sentence the theme of the homily they have just heard. Father Chris DeLerno said the thought of delivering a homily without notes might have been daunting before the course, but he felt he could do that after going through the exercises. Father Kevin DeLerno said Deacon Greg Wilhelm of the Monterey Diocese noticed that the priest had a tendency of turning his head downward when looking at his audience. “You want to make it personal — a revelation of your own faith life — and place that in service to the people, but it should not become narcissistic,” Father Shelly said. 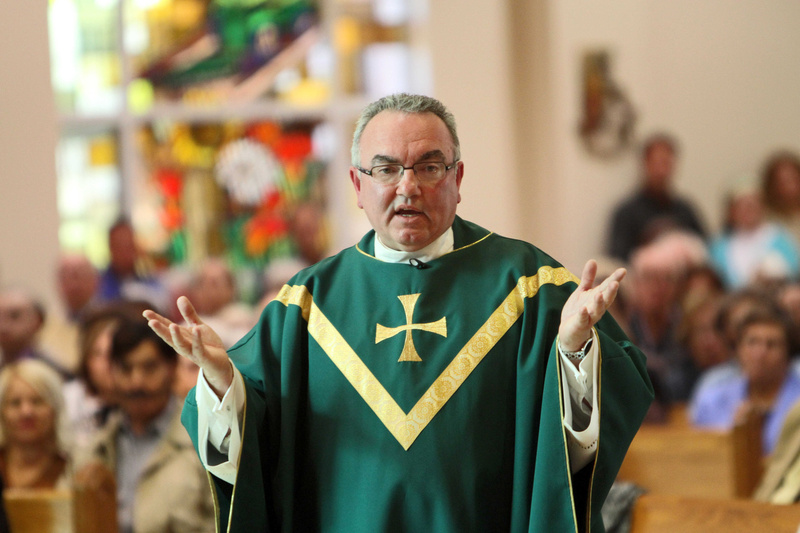 Father Smullen said many times preachers forget the value of silence as a tool in teaching God’s word.